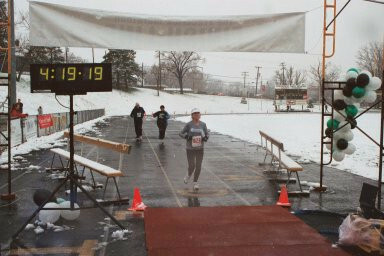 I was just now going through some old files on my computer and came across the race report I wrote after my very first marathon: Frederick Maryland, 2003. I think this report originally appeared in the Second Wind Running Club newsletter. Reading through it again sure brings back some memories, although I definitely no longer agree with the last line. Our bags were packed and we were ready to go when Rob and I received notification that the Washington DC marathon had been cancelled. 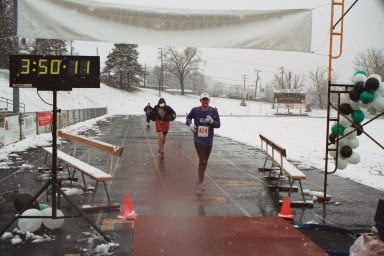 Determined not to let months of training go to waste, we quickly settled on an alternate race-- the Inaugural Frederick Marathon in Frederick, MD on March 30. Race day dawned cold and rainy. 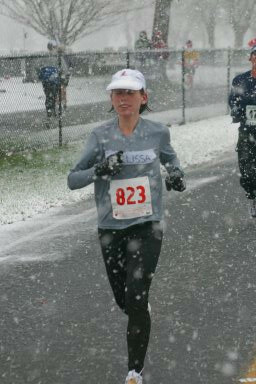 By the time I hit mile 2, thick flakes of snow were falling and the temperature had dropped to the low 30s. I trained in snow and ice all winter, so I thought I was well prepared to deal with this-- no problem, right? At mile 9 I tried to eat a Clif shot-- by this point my gloves were soaked through and my hands were so frozen that I barely fish it out of my pocket, much less squeeze the contents into my mouth. Around mile 11 we entered The Graveyard. Although it was very quaint, I couldn't help but wondering if putting a graveyard into a marathon course was the brightest idea. By now, the snow was really coming down. 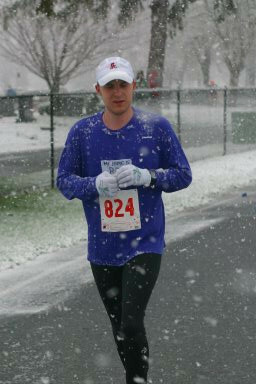 At one point, I flicked a couple inches of snow off the brim of my Second Wind cap. The ground was covered with several inches of slush and getting a bit slippery. My feet were soaking wet and felt like blocks of ice. It had been 72 degrees the day before. 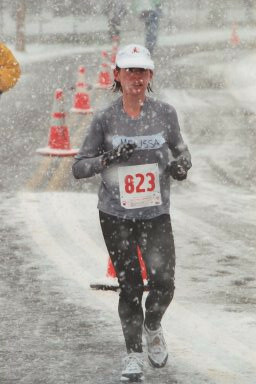 Around mile 15, we headed straight into the driving snow and wind-- my face actually hurt from the stinging snow and sleet. By now, we were out in open farmland-- no spectators anywhere. We entered a very long, very rural section of "bucolic countryside." It was an out and back loop, so around mile 17 I saw Rob (it was around mile 19 for him) and we gave each other a high-five. At mile 19 I tried to eat another Clif Shot, but my hands were so numb and frozen I could barely even hold onto the packet. It took forever to get to mile 20. When I arrived, I was no longer on pace for 4 hours, and everything in my brain and body snapped at once. There was pain everywhere-- quads, hips, feet, hands. I started seeing wavy lines; I got very cold and noticed that my teeth were chattering. I felt like I was completely alone on the course-- I could see a few runners ahead of me, but they were so far away. 6.2 miles seemed like an insurmountable distance to cover. I somehow made it to the end, but I'll still never know how I got there. I kept thinking, if I can just get to the end, Rob will be there. When I crossed the finish line, there was no joy, no triumph, and Rob was nowhere to be found. My clothes were sopping wet and my teeth were chattering so hard that my head hurt. A complete stranger took me over to a heater and gave me a dry sweatshirt to put on. Finally Rob and I found each other, and I began to come back to life. 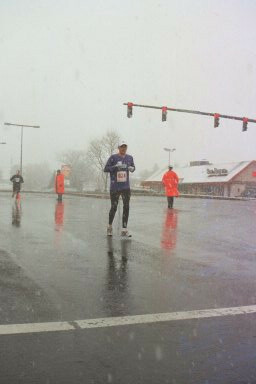 Rob's most recent marathon was one hour and two minutes faster than this. Mile 26. Point 2 to go. Heel striking and 12mm drops were very fashionable at the time. I think this marathon was my Personal Worst, or at least close to it. 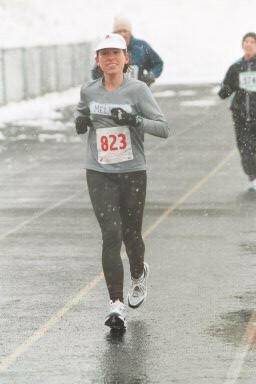 It may have been even slower than the marathon I ran a few months after Will was born, when I had mastitis. For about 3 hours after I finished, I vowed that I would never run again. 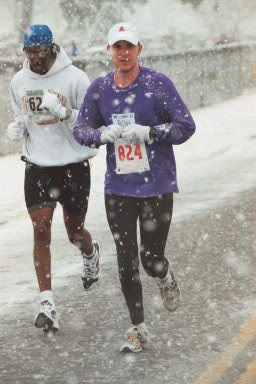 But after the hypothermia began to fade away, I was already planning my next marathon. After all, it can't get much worse than Frederick, can it?